Arvs-Drelen is one of the few Velothi towers to be near an inhabited area, Gnisis. 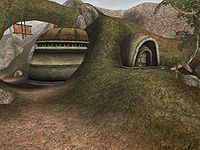 It is currently, and has been for some time, the home of the Telvanni mage, Baladas Demnevanni - who is currently engaged in Dwemer research, and steering well clear of the cut-throat Telvanni politics (and also refusing to pay any taxes to the Imperials, on the grounds that he was there first). While he doesn't take kindly to strangers, he prefers to avoid violence and can become a valuable ally if treated the right way - especially if given the chance to show off his expertise in his subject. Nevertheless, if attacked, he is fully capable of defending himself, with the assistance of two unusual tame pets - a daedroth and a Dwemer centurion. The Berandas Propylon Index is on the top shelf next to Baladas Demnevanni, it can be difficult to see, so you'll need to look carefully. Baladas does not own it. 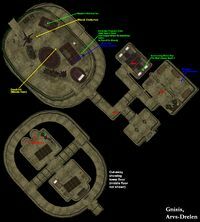 This location also appears in Online. This page was last modified on 19 October 2018, at 22:29.